The LAR 741 Symbiotic Networks: Sustainable Design in Scandinavia study tour, taught by Assistant Professor Jessica Canfield, took place May 19-June 1, 2013. 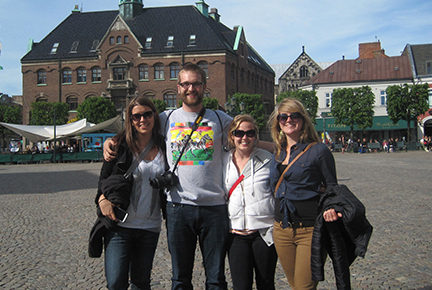 Read about the experiences Ross DeVault, 4th year MLA student, had on the trip. What sites did you visit on the trip? Ørestad – Copenhagen, Denmark- We had the opportunity to view and tour several contemporary mixed use housing projects designed by several famous architects including Bjarke Ingels Group. 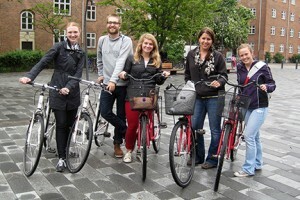 Western Harbor – Malmö, Sweden- Jessica organized a fantastic bicycle tour given by a government official in the traffic planning office. The famous Calatrava building “Turning Torso” is nested in this new sustainable waterfront development. Hammarby Sjöstad – Stockholm, Sweden- This master planned community of over 20,000 people turns heads because of its holistic design strategy. The community operates almost entirely as a closed system with nearly all of the stormwater, recycling, transportation, and architectural systems working together. Various sites – Helsinki- We spent a day in Helsinki on a walking and bus tour to visit several architectural and historic sites. It was fascinating to see how dramatically different cities separated by a few hundred kilometers could be. Tell us a little about the itinerary of your trip. The trip was planned so that we were constantly active in moving through the urban environments of many Scandinavian cities. While we were often very busy meeting with all sorts of city officials, planners, professors, and professionals Jessica did a fantastic job programming in flex time to spend sketching and taking in the scenery. How did the field trip relate back to your class? The field trip allowed me to complete my case study on Hammarby Sjöstad in much more depth than I would have been able to reach prior to the trip. It has also inspired the topic of “Urban Bicycling” for my Master’s project next fall. What was your favorite part about the field trip? The thing I enjoyed most about the trip was the amount of interaction that we had with people who design and plan the built environment in these Scandinavian cities. Speaking to them brought up fascinating insights into the cities that we would have never reached on our own. Observing the multitude of differences in day to day life was exciting and kept us on our toes. Did you learn any interesting facts on your trip about the location you visited? If so, what? The thing that stands out most to me was one comment made by a tour guide who related the bicycle in Scandinavia to the vacuum in the United States. A bicycle is a utilitarian device to simply move from point a to point b as efficiently as possible. What was your favorite site you visited on the trip? Why? My favorite location we got to visit on the field trip was Gamla Stan (roughly: Old town) in Stockholm. This was the oldest part of town, which dates back to the 13th century when Sweden was still ruled by Kings. The tightly knit urban fabric is sliced irregularly by winding cobblestone streets in such a way that any sense of direction is quickly lost without the sun (which can often be a rare sight). These narrow irregular streets open triumphantly into majestic courtyards drastically ranging in size and shape. You can’t help but slow down and take in the ever-changing scenery as you navigate this urban maze. Did you meet anybody on the trip that has influenced your work or thought process? Bianca Hermansen, one of our tour guides in Copenhagen and Olle Evenäs, a traffic planner from Malmö stand out as two extremely inspirational figures from our trip. 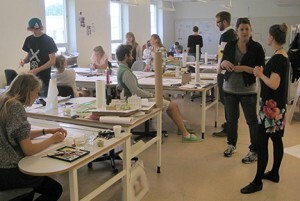 They both spoke of the fantastic ways that good design can adjust behaviors of a city as a whole. Their holistic thinking reflects back into the work I am pursuing at this moment for both my Master’s project and summer internship. As an exciting bonus, while studying in Copenhagen this coming spring I have the pleasure of taking a course taught by Bianca at DIS. What was your least favorite part of the trip? Why? My least favorite part of the trip was leaving each city. Since the trip was brief we did just as much leaving as we did arriving, which left us with heavy hearts as we said goodbye to each of the incredible Scandinavian cities. 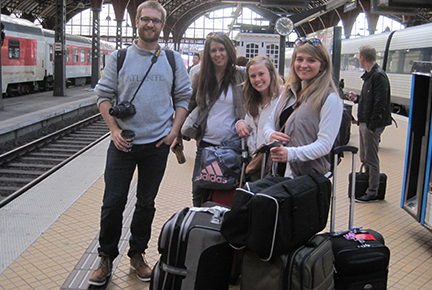 How are you using what you learned on the trip in your current studies? My master’s project would not be what it is without the inspirational visits and bicycle tours we had the opportunity to participate in. Do you have any other memories or thoughts from the trip you’d like to share? I can’t thank Jessica enough for organizing this trip in such a way that we exponentially increased our knowledge of built work and culture while simultaneously having one of the best times of our lives. The trip would not have been the success it was without her planning, leadership, and flexibility. James (Ross) DeVault is from from Chicago, Illinois. His passion for Landscape Architecture was ignited when he took a class his second semester from Tony Chelz during his last semester as an instructor. 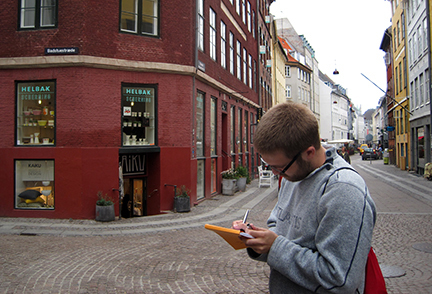 His current interests in the field gravitate around urban design and masterplanning. He wants to learn as much as possible about what makes cities work in his time at K-State. Upon graduation, he hopes to work in a large city at a firm whose focus lies in sustainable urban design. He also strives to work in an environment where research and analysis are valued on the same level as design and practice.